We run all our manufacturing from our state-of-the art, purpose-built manufacturing centre. Here some 140 highly skilled colleagues work as machinists, cutters, team leaders and administrators. Whether you join us as a trainee or a skilled operative, you’ll share our passion for quality work, attention to detail and getting things right first time. No matter how much you learn, you can always learn and progress some more. Things have moved fast for Mo, who started three years ago as an apprentice and now has responsibility for his own line as a team leader. 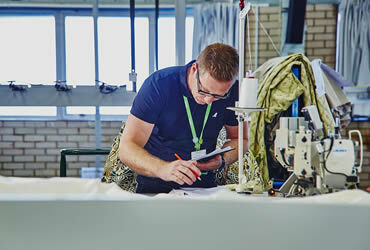 When Dunelm introduced a state-of-the-art automated system, he was sent to Sweden for training with the manufacturer. He says it’s definitely the highlight of his career so far. "As the manufacturing operation has grown, management have helped me grow and develop too." Our team enjoy working on a purpose-built manufacturing site, with investment in state-of-the-art machinery/plant and free on-site parking. If you pass initial screening, we’ll invite you to an assessment centre where you’ll meet us and other applicants. On the day, you’ll take part in a few simple exercises that help you show off your skills and decide if the role is right for you. Manufacturing is changing fast with the introduction of new technology. Dunelm keeps our skills up to speed.